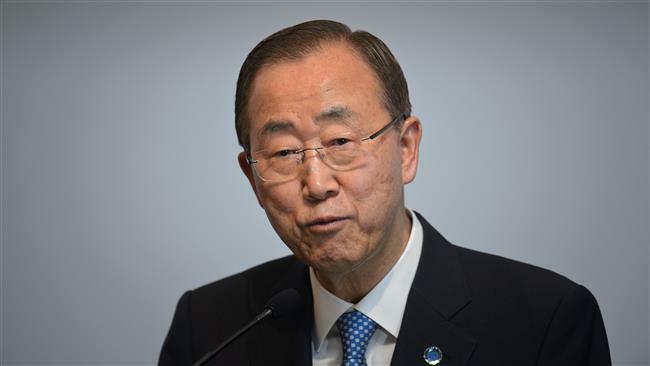 He added that the UN chief has also received “troubling reports” that cluster munitions have been used against civilians in many locations in Sana’a. “The use of cluster munitions in populated areas may amount to a war crime due to their indiscriminate nature,” the UN spokesperson pointed out. At least one Yemeni civilian was killed and a number of others were injured after Saudi jets pounded various districts of Sana’a, using cluster bombs early on Thursday. Saudi warplanes also bombarded residential buildings in the al-Marzaq district of Hajjah Province, killing four people and injuring two others. “The inherently indiscriminate nature of cluster munitions makes such attacks serious violations of the laws of war,” Steve Goose, arms director at Human Rights Watch, said in a statement on Thursday. Dujarric further said the UN chief was urging all parties to the Yemen crisis to cooperate with his special envoy Ismail Ould Cheikh Ahmed in efforts aimed at resuming peace talks as soon as possible. Saudi Arabia began the military campaign against Yemen in late March 2015. The strikes are supposedly meant to undermine the Ansarullah movement and restore power to fugitive former Yemeni president, Abd Rabbuh Mansour Hadi. The Human Rights Watch said in late May 2015 that Saudi warplanes had targeted civilians and residential areas with cluster bombs in the northern province of Sa’ada. Yemenis have responded with attacks against Saudi forces deployed in the country as well as targets inside Saudi Arabia.